My latest Washi dress... numero 3! See my little peek-a-boo contrast fabric on the sleeve? I had originally wanted to make the sleeve fold up so that the contrast is more visible, but given my buff arms (don't be jelly) I need to alter the sleeve in order to do so properly. I guess I have to make another one. I'm in love with the piping detail and the skirt band. Oh my gosh, have you seen Rae's collar tie on her latest Washi?! Have a lovely Monday, folks! oh my goodness this dress is perfection!! I love the color combo! And, the piping and band at the bottom are fab! Thank you! :) This is my fave color combo at the moment. We'll see how the dresses hold up by the end of the summer because I'll be wearing these over and over again. Awww, thanks Yeka! Speaking of gorgeous... hello, your mandarin blouse is beautiful! Yes, I saw the lunch box and I immediately thought to myself, "cool colors!" So when are you going to make your washi??? I'm SO happy your happy!!! Nah, I don't think it's weird, I do it all the time. I am loving this washi version so so much! The colors are so great. And ahhhh that piping! I think the piping was the cherry on top, no? It was pure luck I had piping in the exact color of the orange in the chevron fabric. Thanks Erin! awesome. i just love the washi dress pattern. im gonna thry a version like yours soo. so cute! This colour combination is just perfect, and the dress fits you so beautifully! I will really need to give this pattern a try. Thank you, Kathryn! This is a great pattern... I can'y say enough good things about it. You have to try it! oh man this one is stunning!! well done on the contrast and piping!! I wonder if there is a Jennifer size? Did you make a muslin first? I don't remember if you said. I need to move you to "people I know" on my blog because I never see you in my blog feed (there are just too many blogs in there) so I never know you post new stuff. This is so utterly gorgeous... That combo is insanely beautiful! I made a washi too recently and i loved it so much i made another one! its gotta be up there in the top 10 of best patterns i reckon! Oh my! 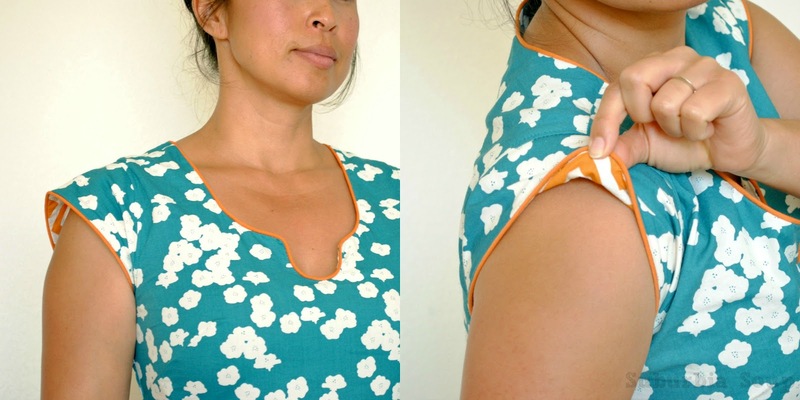 I only just noticed this dress over at Sewpony's blog. What a gorgeous dress, and what an amazing color combination! Perfection! Wow I really love this dress! Do you mind sharing what the blue fabric is or where you got it? It's gorgeous fabric... after a few washings it's super soft. This is so freaking awesome. And it makes me want to make my next washi reversible! I have googled many washi dresses for inspiration and yours is the best one I've seen. I love the use of different fabrics and the piping! Awesome!